Online Swaps: 8 Sites to Swap Your Stuff - Trade Stuff online Mashable! Add Tags to Your Outlook Email Messages - Amit over at Digital Inspiration shows us how to make Outlook a little more like gmail. Take Google Maps and add to that a tool that tells you "How far is it from point A to B." This is what the Gmaps Pedometer Mashup does. If you walk, run, bike or swim this is an excellent web tool for you. It's a Google Maps Mashup that lets you set up waypoints and it calculates the distance in miles as well as the number of calories you burn after you input your weight. The calories thing is obviously dependant to your pace also, but its a good approximation. Once you've created a route, you can save your route, use the elevation tool for hills and indicate where you want mile markers on your route. 1. Rather then driving your car along the jogging route to estimate the distance, input your jog route into the Gmap Pedometer to see how far it is. 2. Estimate how many calories you might be burning with your run, jog, walk or swim. Not exact, but a good estimation. 3. Set up your cross-country team's runs on the map and publish it on the cross-country team's website as a resource. 4. Prepare for a marathon with the map links on your website showing the routes and distances. When you log into the site, you'll see the google map of the world starting with the U.S. Just like in Google Maps, drag or double-click to move the map, use the slider to zoom in our out and select Map, Satellite or Hybrid buttons to switch the type of imagery. You can enter an address, city or zip (just like in Google Maps) to pick a starting point. Once you're ready to to record the distance you traveled (or will travel) click the start recording button. After that, each double-click will draw a point on the map and the distance from each point will accumulate and appear in the boxes above. Each double-click will create a new point. When you have your route set, you can save the map and link to it from your site. You can also view a graph showing the elevation of each point plotted against distance (in Canada, UK and US). Another feature is the ability to print the completed map. Sony calls it a Living Room PC, but it's really just a basic pre-built HTPC in the shape of a hat box or Roomba. It comes with a Intel 2 Duo Processor 1.83GHz and Windows Vista. This thing has no HD optical drive and no CableCard slot, but it does have an HDMI output and a compact wireless keyboard all decked out in ipod white. Definitely a unique design for a PC. If you're into the styling and have cash to blow, it's running $1,600.00 and available now. PiciShare is an alternative search engine for Flickr to your average Flickr Search. The search engine provides a simple click and search interface that enables you to modify the search preferences more efficiently. You can select the search results per page, sort by: relevance, Date Posted (ascending), Date Posted (by description), Date Taken (ascending), Interestingness (ascending) and Interestingness (by description). If you're in to flickr searches and have a blog or website, check out my post about how to add a custom flickr search to your site. Here we go again! Technorati hasn't been updating posts, links or authority for several days now and there's been no response by admin on their "help" page or from their ticket support system. The problems for me began before Technorati dropped off the web due to the power outage in San Francisco and have continued every since. No updates for new posts and for even a longer time, links to this blog haven't been updating properly - some work and some don't. I don't expect lightning-fast responses her (although that would be nice) but I would like an acknowledgement by Technorati of the problem at least. So I ask for the second time this year: Is Technorati dying? It needs some major work and tlc to continue as a force in the blogging world. I wonder how long it will be before it gets fixed. If it's too long, it will just whither away as a blogging after thought.... Let's hope this isn't the case. Would you like to add a custom flickr search box for your blog that only searches your photos? I found some html code you can add to your site to make a custom search box for your blog that searches only photos with your flickr username. I'll share with you how to do this for your site. After reading my article on tagging photos & uploading to flickr with iTag, A reader asked me if I knew of a way to add a custom search box to your site that allows visitors to search only the pictures you uploaded to Flickr. The short answer was no, but I did some looking around and found the html code to make your own search box to search only your photos on flickr. 1. First you will need your "raw" flickr ID#. This is the ID that is a string of characters, not your human-readible flickr name like evansfam. For example, my "raw" ID# is 94336434@N00. To find your "raw" Flickr ID # go to Flickr People Info Finder and you will see your ID# listed along with several other things flickr tracks. 4. Now insert the code into your site. That's it! Now when you type in a search term into the box, it will search for that text in the description, titles and tags of your photos on flickr. All results will open up in a new window on the flickr page. 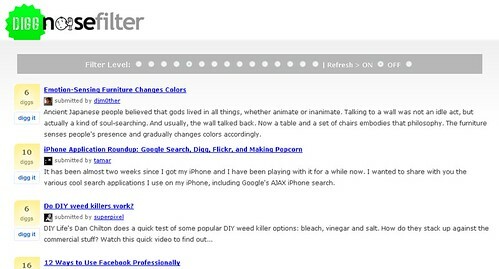 (NOTE: THIS IS ONLY A SCREENSHOT - TO TRY THE CUSTOM SEARCH OUT ON THIS SITE, GO TO THE TOP-RIGHT OF THIS BLOG FOR THE SEARCH BOX. Del.icou.us: Monitor to see if your site was submitted to delicious using the following link: http://del.icio.us/rss/url?url=http://site.com/ and changing the "site.com" to your site's url and subscribe to the RSS feed. Furl: Use the Furl.com search for your site's url and subscribe to the RSS feed. StumbleUpon: For StumbleUpon I haven't found a good way of subscribing to an RSS feed so I use the non-official Stumbleupon Search created using Google Coop. Alternatively you could just do a google search using: "lifehacker.com site:www.stumbleupon.com" in the google search box. Just change "lifehacker.com" to your site's url. Don't have time to read the 750 or so pages of the the latest Harry Potter Book - Harry Potter and the Deathly Hallows? I recommend you purchase the audiobook. It is narrated by Jim Dale who is one of the best narrators ever. My family has listened to the previous six Harry Potter books narrated by Mr. Dale during long roadtrips after ripping the CD Audiobooks to use on my iPod- here's how to do that by the way. Even if you've read the books, listening to the audiobooks is really enjoyable mostly because of Mr. Dale's excellent narration. If you don't want to fork over the almost $50 for the audiobook, go reserve a copy at your library - there's probably quite a wait, but most libraries carry several copies. SiliconDust announced today that their Dual Network QAM/OTA HD Tuner now works with the Mac's EyeTV. I wrote a review of the excellent HDHomeRun tuner back in March. These HDHomeRun tuners have been flying off the shelf since that time as it now works with most (if not all) of the Windows Based HTPC software as well as MythTV and now the Mac! This is one of the best products out there for the HTPC user so if you're a Mac user and have EyeTV, go get one now at SiliconDust - you won't be sorry! Want to find the stories that are just beginning to gain popularity, but before they hit Digg? Russ Virante has developed a digg tool using the digg.com API to filter through the most recent 500 stories based on the minimum number of diggs received. This way you can catch the likely-to-be-hot stories before they hit the front page. This is a great way to find the stories that are already getting a high number of diggs, but before they are considered popular. You can select the filter level to select the level of filter you want to use - the higher the filter (further to the right) you select, the more "recent" diggs it requires to be on the noisefilter page. You can also turn on or off the automatic page refresh. If this is on, it will refresh the list every minute or so.